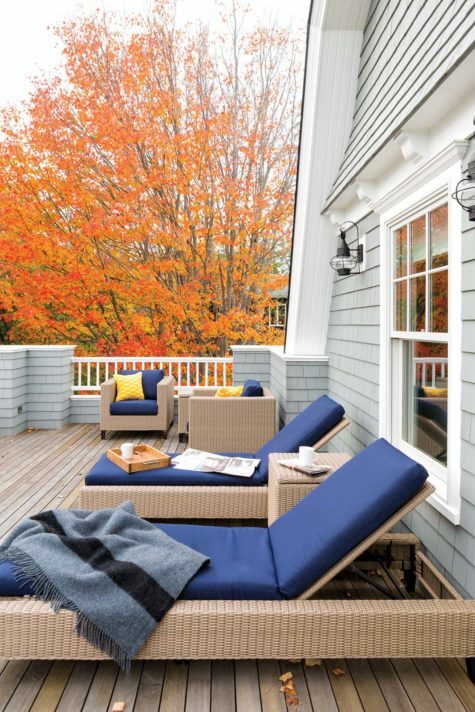 The deck off the owners’ bedroom offers sea views and a back-of-the-house respite. Half walls add privacy while railings keep the view open. 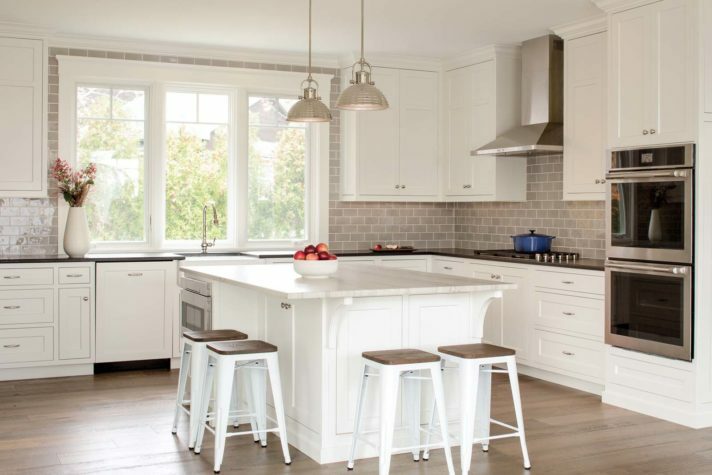 Jeanne Rapone of Centerline Design and Build in Yarmouth designed the kitchen to accommodate the homeowners’ holiday gatherings with family. Double ovens simplify large-scale cooking, while the uninterrupted quartzite surface of the island makes for easy cleaning. Gray subway tile walls and black granite countertops keep the palette simple and fresh. 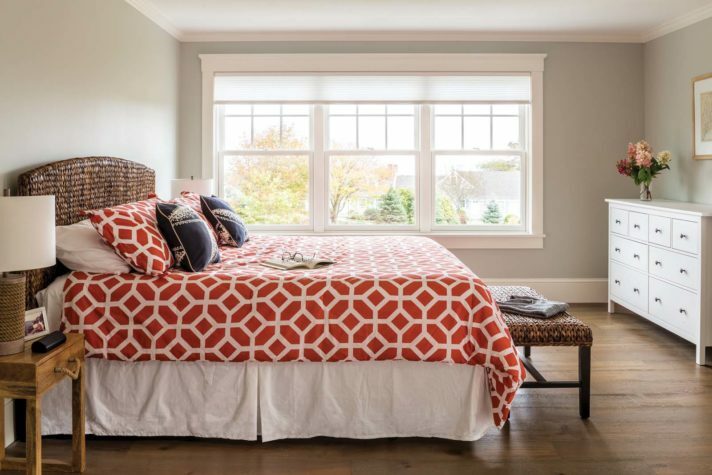 The owners’ bedroom displays the home’s color scheme: gray-brown floors of French oak, walls in Benjamin Moore’s Stonington Gray, white millwork, and colorful, graphic textiles. 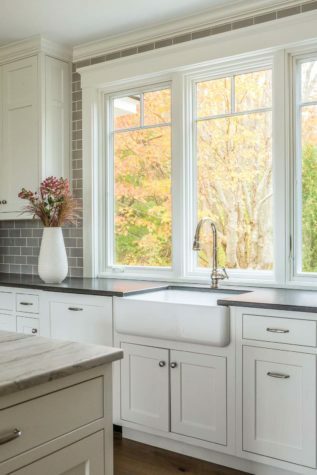 Windows behind the Kohler farmhouse sink offer a view over the small yard behind the home, where the family gathers for lawn games and grilling. The dining room’s farmhouse table was made by the homeowners’ friend Beth Bawell of BB Designs in New Hampshire. Four-panel glass doors can be opened for a seamless transition to the patio. 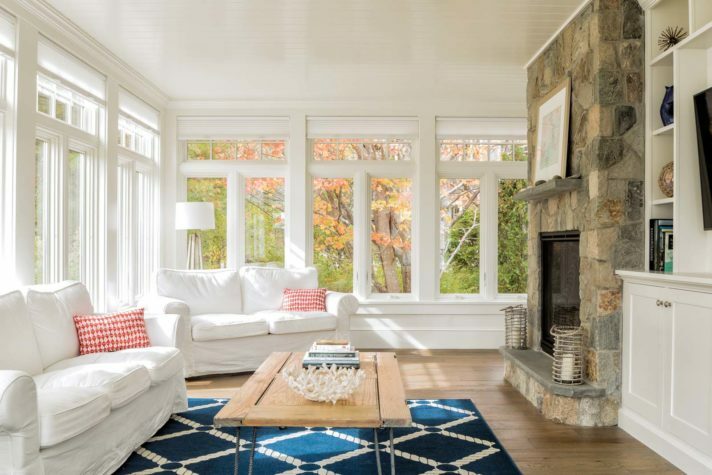 The sunroom features millwork and stone by Richard Moody and Sons Construction. Homeowner Michael Maka made the coffee table from a salvaged barn door. The daughters’ room (opposite) has double bunk beds for sleepovers and ocean-facing windows for stargazing. While the upper floors are designed for privacy, the main level is open, inviting gatherings of groups large and small. “You walk in and you have that openness, those windows leading off the dining room,” says Moody. “I love how bright and airy the house is.” Sitting and dining spaces are marked by square white columns that provide structure without interrupting the flow of the house. The dining area is defined by a pine and fir farmhouse table made by the homeowners’ friend Beth Bawell of BB Designs in Amherst, New Hampshire (Bawell also contributed a matching side table and a wooden sign with the home’s geographic coordinates). The Makas did the interior decor themselves, and they can express their design principles in one word: simplicity. The home is unified by floors of Bella Cera’s Villa Borghese French oak in a soft gray color that the couple found at Nashua Wallpaper and Design Center in New Hampshire. 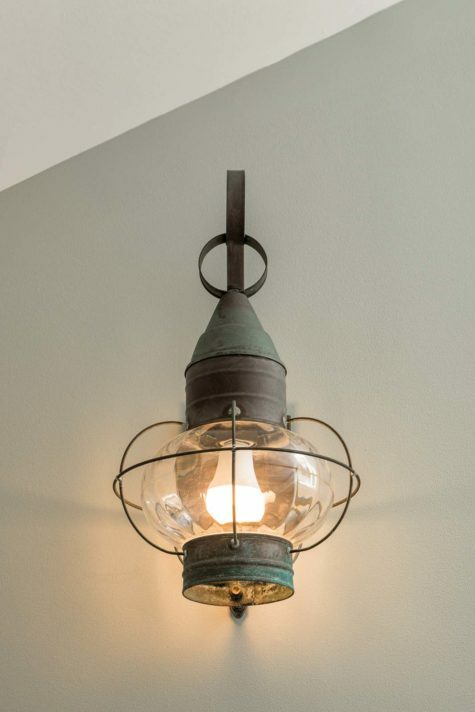 With the exception of the white bathrooms, all the walls are painted in Benjamin Moore’s Stonington Gray, a gentle neutral that seems to shift from warm to cool as light and shadows fall on it. To this calm foundation cheerful accents are added by blue, red, and orange textiles on the sofas, rugs, and pillows. Custom white millwork with decorative accents from Richard Moody and Sons offers textural interest and provides spaces to display family treasures and nautical objects. The wall decor is minimal, and all of it has personal meaning for the family. Photographs recall the family’s history in Kennebunkport, including the Cape Porpoise home of Michael’s grandparents, and just inside the front door is an enormous enlargement of a municipal sewage bond, a winking reference to Michael’s work in financial services. Other special areas link the house with the outdoors. A deck off the owners’ bedroom features half-walls for privacy and chaise lounges for enjoying the view in comfort. “I love it in the morning,” says Janelle, then adds, “I love it in the afternoon. I love it always.” From the dining area, four-panel sliding glass doors open onto a bluestone patio; in summer the doors can be opened to create a seamless transition between inside and outside. On the higher side of the lot, the patio has a fresh, elevated feel; the landscape team, CL Design and Landscape, led by Carol Laboissonniere, raised the level of the yard so that railings aren’t necessary. (When I visit, the patio is occupied by the homeowners’ mothers, enjoying a late-afternoon glass of wine while chatting with their granddaughters.) The stone steps that lead to the front door are a striking aspect of the exterior, rising nearly half a flight from the driveway to a recessed landing. 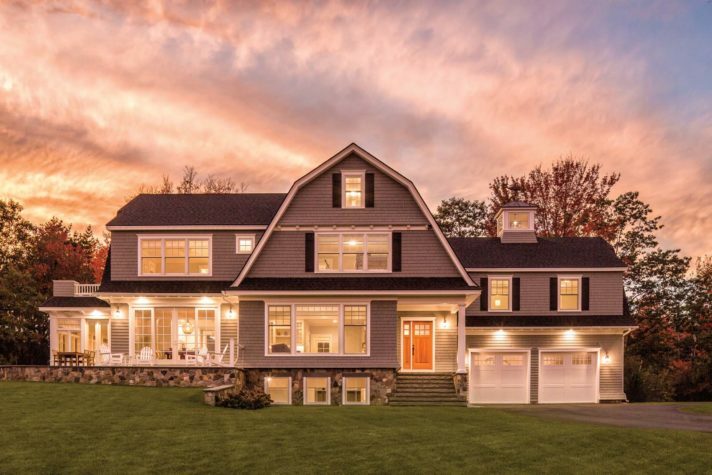 “It’s a very sculptural piece,” says Beaudette, who praises Bill Walsh of Walsh Engineering Associates in Westbrook for creating a “gracious” driveway and front yard on the challenging lot.